Punjab public Service Commission PPSC now declared Exam schedule of Punjab state civil services combined competitive examination - 2014. According to official notification of PPSC Punjab PCS or Punjab Civil Service Preliminary examination 2013 will be held on 16 march 2014. Previous date for PCS exam was set as 2 February 2014. Branch), Deputy Superintendent of Police, Deputy Superintendent of Jails (Grade-II)/ District Probation Officer (Jails), Tehsildar, Excise & Taxation Officers, Block Development & Panchayat Officers and labor and Conciliation Officer .. first of all preliminary examination will be held for the recruitment of 120 posts of various category. 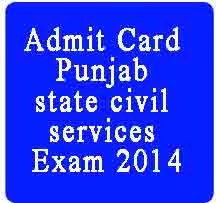 All those candidates who applied for PSCSCCE-2013 now informed that official admit card will be hosts at the official website Punjab public Service commission. Total 33067 candidates applied for the civil services examination and 24278 found eligible for preliminary examination after the scrutiny of the database. Candidates can download there admit card via enter there personal information online. It is compulsory for each Candidate to bring the Admit Card on the day of examination. Any failure to bring the Admit Card shall result in barring the Candidate from appearing in the Examination.